Excellent location, friendly staff, clean and nice pools. Great choice of food for dinner and breakfast. Nice wellness area, very good restaurant with some original local food. Excellent food choice for breakfast. Quick and professional service in the restaurant. Apartment was clean and comfy. Spa and aqua park offer great fun. Cool disc golf course. Apartments are fine and close to the indoor and outdoor pools. On walking distance good restaurants and beautiful landscapes if you decide to walk around. Great location for walking across to the spa. We ate at the pub on the road at the entrance and is was great. The spa was great. Excellent location, about half of minute by foot to the swimming pool. Across the apartments is a pub, with pool and darts. Good choice of food for breakfast and dinner. The termal pools,the breakfast and dinner. The appartment was really clean. It was clean, beds were comfortable, price was fair. 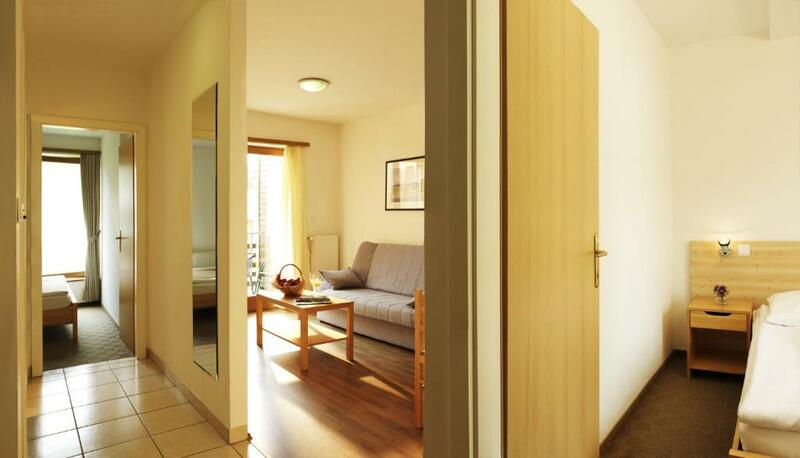 Lock in a great price for Apartments Regina - LifeClass Terme Sveti Martin – rated 8.4 by recent guests! 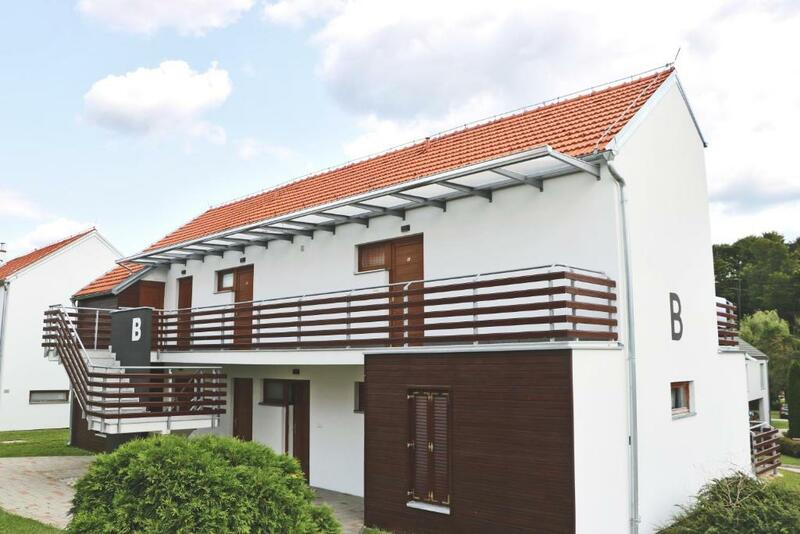 Quietly located on a shallow slope amid forests and meadows, Apartments Regina - LifeClass Terme Sveti Martin offers modern-style accommodations with a balcony. A variety of spa facilities and sports grounds are available free of charge. Guests of Apartments Regina benefit from free use of the gym and the indoor and outdoor swimming pools, available from check-in until check-out. Water aerobics and children's animation programs are available. Each well-lighted apartment is air conditioned and comes with satellite TV. The fully equipped kitchen is fitted with a microwave and a fridge. A sofa bed is provided in the living room. The apartments are part of Spa & Sport Resort Sveti Martin which includes a 4-star hotel, whose facilities can be used at a surcharge. The complex also consists of a golf course, an Irish pub and an à la carte restaurant. Special dietary needs can be catered for. A grocery shop can be reached in a 1-minute walk. Sveti Martin Na Muri Village is 2.5 mi from the apartments, and the town of Čakovec is 11 mi away. International airports in Graz and Zagreb are within a 74.6 miles radius. Front desk charges for pick-up service. On-site private parking is available for free. When would you like to stay at Apartments Regina - LifeClass Terme Sveti Martin? Air-conditioned apartment with 1 bedroom and a full kitchen. The apartment comes with satellite TV, a king bed and a balcony. Air-conditioned apartment with 2 bedrooms and a full kitchen. The apartment comes with satellite TV, 2 king beds and a balcony. Spend an unforgettable vacation, celebrate New year of 2017, have fun and get a chance to try the unique "Temple of Life" pool complex. House Rules Apartments Regina - LifeClass Terme Sveti Martin takes special requests – add in the next step! Apartments Regina - LifeClass Terme Sveti Martin accepts these cards and reserves the right to temporarily hold an amount prior to arrival. If you are bringing your children along, please state their age in the "Special Requests" field. Apartments could use a bit of work, lights broken, no kitchen towels, a little bit of paint, etc. Great staff and food, nice place to relax. Beds could have been more comfortable, without big hole between them. Small offer of cheese and fish meals. Shower water temperature difficult to adjust. Tv is ancient. Very clean. Nice beds. Good location. They should replace the carpet,it is old and has many stains,which gives a dirty feeling when the appartment in fact is really clean. The WC should be replaced aswell. It was a bit old, and floor heating couldn't be turned off, closing the door for the night was a bit complicated. Nice charging station for EVs, NIce apartment, nice spa facilities. Helpful and polite staff. I especially loved the special oily thermal water. A bit worn out apartment with quite small windows, spacey but squeaky bed. The apartment we stayed in was very basic and, even though it was comfortable size-wise (two bedrooms and a small lounge/kitchen area) it wasn't a very nice place to spend time in. The furniture was outdated and whoever decorated it paid no attention to details (no plugs next to the bed, broken bed lamps, no decorative pictures, only one mirror, no shower attachment, thin and useless shower curtain). It's a shame because with (for example) IKEA now available in Croatia, it's very easy to find affordable furniture and decorative elements to upscale the apartments. The kitchen area lacked some basic stuff needed for cooking (no chopping board, no peeler, only one cutting knife which was barely sharp enough to cut through an apple, one kitchen towel...). The apartment was good value for money, but as a part of the LifeClass Terme, there was a huge contrast between the apartment and the rest of the complex. I don't mind staying in a simple accommodation, but it's definitely false advertising listing this property as a part of a 4-star resort. Public Transportation to location was big problem. Tha hotel could have service transportation to nearest center. Only bathroom need reconstruction - ugly. Great dinner and breakfast! Room was quite clean and after reconstruction - looks ok. Parking in front of room. Thermal park in price - very good. We didn’t like that the bedroom it was too small I kept on hitting myself on the heater radiator and I have a lot of bruises from that. At the Toplice I slipped on the stairs going down into the warm pool going to the outside section the stairs were very slippery, I was very careful but I slipped and have a sore and bruised foot and toes from it. Also their is nothing close by to do if you don’t go to the Toplice. My recommendation is that those stairs get tiled with the same time tiles that the inside warm pool is tiled with, they aren’t slippery, they are rough and not slippery. The Pub opposite the Toplice is very expensive, compared to the rest of Croatia that we visited.